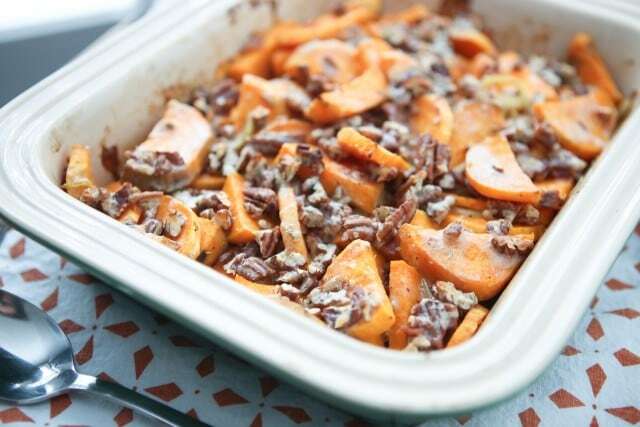 This Savory Sweet Potato Gratin with Pecans recipe is sponsored by Fisher Nuts. It’s no surprise that sweet potatoes are a popular side dish this time of year – especially for holiday meals. 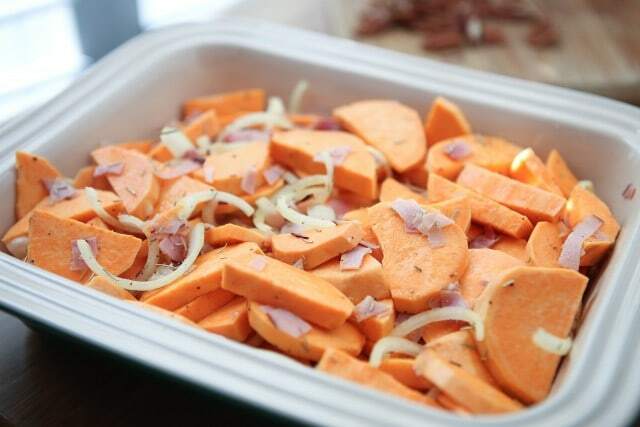 Because they are filled with so much nutrition, I really do enjoy sweet potatoes all year long, especially made as sweet potato fries or rounds, or paired up with up with smoked chicken-apple sausage and more veggies in a simple sheet pan meal for one of my go-to quick dinners. 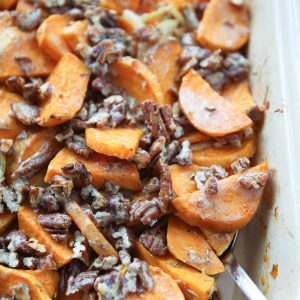 Although I do enjoy a traditional sweet potato casserole on Thanksgiving, I tend to like my sweet potatoes served in more savory recipes like this Sweet Potato Gratin with Pecans I’m sharing today. The combination of flavors in this dish is absolutely delicious, and the Parmesan-pecan topping adds crunch and texture that will make your tastebuds sing. You can’t go wrong serving this dish alongside beef, roasted chicken or turkey. I was inspired by one of my favorite books, The Flavor Bible, when I was creating this recipe. It suggested the flavor combo of sweet potatoes, rosemary and onion – freshly grated Parmesan and chopped pecans felt like a no-brainer addition to me. 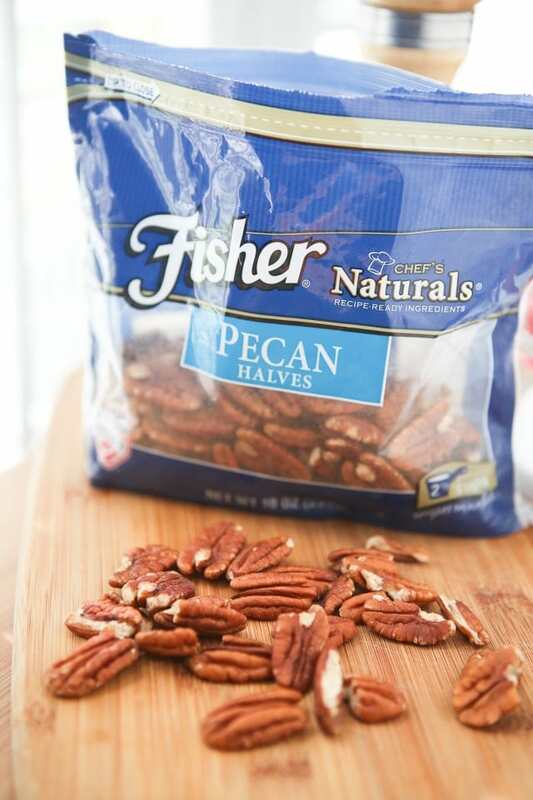 You all know how much I love using preservative-free Fisher Nuts in my recipes! Visit Fisher Nuts for more seasonal recipes created by Chef Alex Guaraschelli – so much deliciousness to add to your table! In a large mixing bowl combine sweet potatoes with onions, prosciutto or ham, rosemary, salt and pepper. Spoon into a large baking dish and cover with aluminum foil. Bake in 400 degree oven, covered, for 30 minutes. At 30 minutes, remove foil and gently stir sweet potato mixture. Cook uncovered for an additional 10 minutes. In a small bowl, combine milk, nutmeg, chopped pecans and Parmesan cheese. Spoon evenly over sweet potatoes and bake for an additional 10 minutes until cheese is melted and bubbly. Recipe inspired by The Flavor Bible. Oh, I love your savory sweet potato recipe! The pecans are a must! This salty/sweet combo is EXACTLY what I need TODAY. I lovelovelove that creamy sweet potato with the crunchy nuts – so perfect! Pinned! 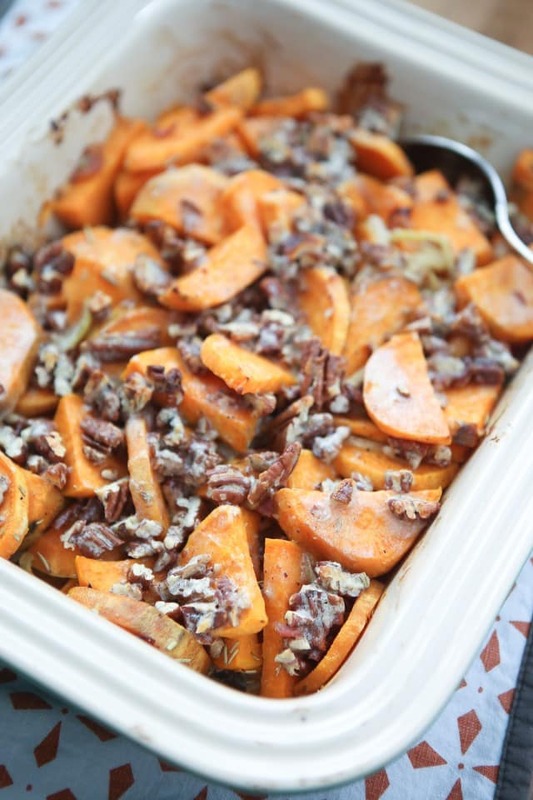 I love the addition of pecans in your sweet potatoes! So smart! I love savory sweet potato dishes! Can’t wait to give this a try! I have had regular potato gratin before but never sweet potato gratin! This sounds delicious with the addition of salty prosciutto and crunchy pecans! Yum! Oh, wow…this looks amazing. I love sweet potatoes and love the additional texture of the pecans. My mom made a sweet potato dish with pecans on top for Thanksgiving and it was so good – I really liked the contrast in textures. I love all the savory ingredients going on in your dish – especially the rosemary. This sounds so good! Pecans are my favorite with sweetpotatoes! My Mom and I have made a mashed version of this for years, so I think we can change it up to try this one. This looks like a great dish for holiday meals! Love the crunchy pecans! Now this is the kind of sweet potato grain that I enjoy. 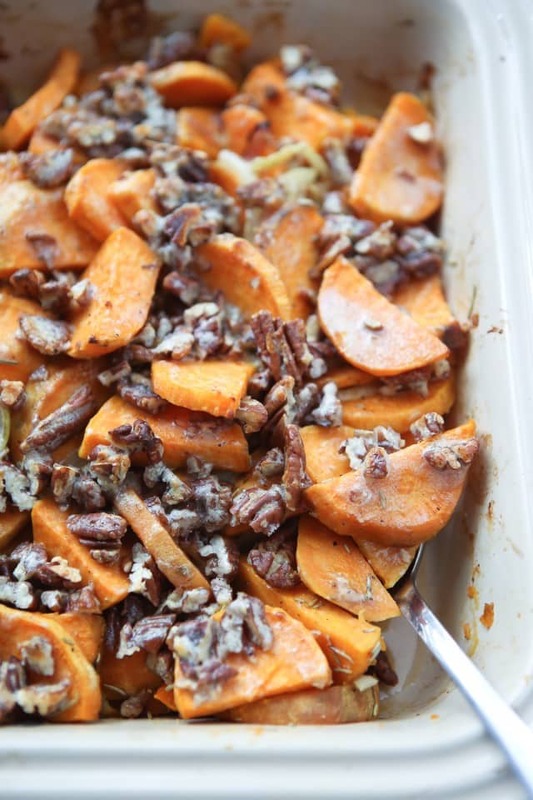 I love that you let the natural flavor of the sweet potatoes shine through and elevated them with the pecans. Sweet and savory is a definite yes for me. This sweet potato gratin is absolutely my kind for the holiday table. I love everything you do, but this recipe is not so super. Different, yes? But why ruin sweet potatoes with all the other stuff just to do something different? I followed the recipe…loved the texture but there was no way to even know that it was sweet potatoes we were eating. There is nothing better than a sweet potato baked with the skin on and then butter added and a little brown sugar added. I am sure this recipe is healthy but…it leaves a lot to be desired. I’m sorry you didn’t enjoy this one Barbara, thanks for the feedback. I agree, a simple baked sweet potato is delicious but I do enjoy changing it up every now and then. Have a great holiday!